Irrespective of the preferred style and type of shoe design, the trending metallic colours go well with all. Right from booties, to decollete, sandals to lace-ups or Mary Janes, the metal love can be paired with everything. If you are thinking where would you wear these trendy colours, our answer is every day. Equally rocking and charming in the day as well as night time, the metallic combination helps to add a distinct touch to your outfit while also looking sophisticated for formal wear. Take a look at the designs and fall metal over heels with these 10 footwears for Fall Winter 2016-2017. 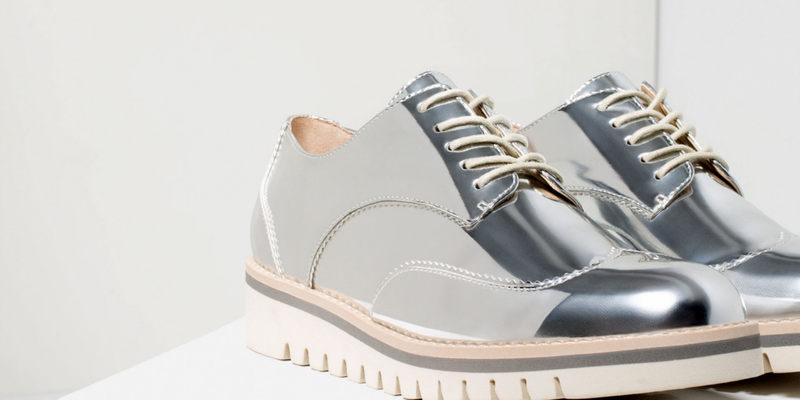 Zara flat shoes carrying a brogue style detail have a silver toned finish with a laminated effect on top. Comfortable and stylish, the sole comes in contrasting colours with a height of 3.8 cm. The high shine brogues in golden metallic finish certainly reflect the timeless style of Prada. Crafted in Italy from rose gold leather the brogues are detailed with jute and foam sole. Rock the look with cuffed denim. The sleek and beautiful Valentino sandals carrying a rich golden hue are crafted from metallic leather. Crystal studded straps attached to high heels positively extend the glamour quotient. Sport the attractive pair with mid length skirts and pants. The flat silver toned shoes by Zara are definitely the everyday pair you can style with formals as well as casuals. The laminated top flats carry the topstitched detail on the instep and folds at the heel. The height of sole is 1.2 cms. Loafer style inspired pumps can be paired easily with print as well as solid outfits. Made in Italy from silver and pastel yellow leather, the pumps feature the chunky block heels. This versatile piece can be paired well with cropped pants as well as trousers. Made from reflective silver-toned leather, the sandals carry a bold and edgy look. With the snap-buttons at the ankle, the pointed heels convey a contemporary edge. Pair this beautiful pair with high hemline outfits. Carrying a soft and feminine appeal, these quilted sneakers are made from platinum-hued leather. The motif and the design on the top make the look stand out amongst all the multiple pieces. The panel on the back of the sneakers has the designer’s name carved subtly. Pair the quilted sneakers with black jeans for the urban chic look. Golden heel laminated shoes by Zara are round toed with comfortable block heels. The heels are 5.0 cm in height. Acne Studios’ sneakers are crafted with orange metallic leather and come with the platform sole and the brand’s signature face that for sure adds the fun factor to the dressing. Mirror finish silver leather pumps from Balenciaga are the pointed toe, sleek heel pumps. The pumps are great to add a striking addition to any outfit. Wear it with skinny denim or ankle length skirts to give your outfits a glamorous turnover. Enjoy the metallic fashion seasoning and make your look stand out minimally and effortlessly.